Dr Al Mandoos was unanimously elected at the RAII session in Abu Dhabi. He succeeds Dr Abdullah Mohammed Al Mannai, Permanent Representative of Qatar to WMO. Rishi Ram Sharma, Permanent Representative of Nepal to WMO, was elected vice president. The World Meteorological Organization’s (WMO) Regional Association for Asia opened its four-yearly session on Sunday with warnings that the region – which stretches over high mountains and low lying coastal plains from the Arctic to the Equator – is exceptionally vulnerable to extreme weather, climate change and water shocks. Abu Dhabi, United Arab Emirates, 9 February 2017 (WMO) - Climate change, environmental degradation, population growth and urbanization are putting pressure on water supplies in many parts of the Asian region, and exposure to extreme weather and other hazards is increasing. At the kind invitation of the Government of the United Arab Emirates, the sixteenth session of Regional Association II (RA II-16) will be held in Abu Dhabi, United Arab Emirates from 12 to 16 February 2017. 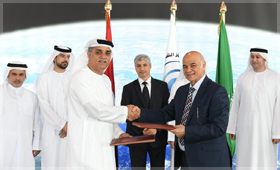 The National Centre of Meteorology and Seismology (NCMS) and the University of Sharjah (UoS) have signed a Memorandum of Understanding (MoU) for joint cooperation in meteorology and seismology.